The Valley of the Temples is the site of Akragas, an ancient city founded the year 581 BC by colonists from Gela and Rhodes. Its history lasted for more than a thousand years and ended between the VII and the IX century AD, when its inhabitants moved to the Girgenti hill, that is on the most western end of the area where the ancient Greek city used to be built. 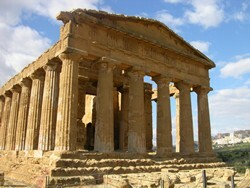 The ancient classical city which stretched between the Rupe Atenea hill and the Ridge of the Temples, shows the remains of its impressive buildings in what we call today the Valley of the Temples, a unique art heritage. Not so long ago, the so called Valley of the Temples covered only the area between the Ridge of the Temples and the Rupe Atenea hill. Today it includes also the surrounding area where you find the necropolis and the extra-moenia sanctuaries (that is outside the ancient city walls), and where the rivers Akragas and Ipsas flow down to the sea by San Leone beach. The environmental and natural balances are strongly enhanced by the intervention of man. They fuse admirably together with the archaeological monuments, solemn like the temples, discrete and suggestive like the necropolis and the complex hypogees. However most of the ancient classical and roman city is still hidden under almond trees and hundred year old olive trees. Even today the remains come to the surface of this secret reserve to show more of its own past. In the middle of the 1900’s an aerial view showed one of the most interesting sides of the town: the Hippodamian street plan in the area between the southern ridge and the foot of the Rupe Atenea hill. Six wide roads (plateiai) covered this area from the East to the West and were crossed by 30 narrow streets (stenopoi) according to a grid plan. All the buildings of the ancient city, including the temple of Zeus, the gymnasium and the buleuterion, were inserted in this regular layout. Today clearly visible modern changes concern especially the San Nicola area. There you can see the remains of ancient public buildings next to the different terraces connected one to the other by ramps and steps and on which the city was built. Our tour will start by picking you up from your location,The city, of Greek origin, in noted for its famous Valley of the Temples. The visit includes the temples of Concord, Juno, Herakles, Olympianzeus, Castor and Pollux.Stop stop for lunch - then continue to Piazza Armerina to visit the Roman Villa was built by the Romans during the 3rd and 4th century A.C., on a previous rustic construction of the 2nd century A.C. Professor V. Gentile, that performed the archeological excavations in 1950, attributed the construction of the Villa to the Roman emperor Maximianus Herculius an this is still the most accredited theory. The Villa was certainly inhabited until the 13th century when it was destroyed by Guglielmo il Malo, together with a village that is still buried in the surroundings. Afterwards the Villa was covered by debris from Monte Mangone and all traces of it were lost until 17th cenury, when an eminent inhabitant of Piazza Armerina, Chiarandà, wrote:”In the Casale district there are walls and ruins on unknown origin”. 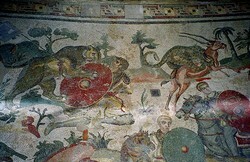 During excavations in 19th century, the Triclinium was bought to light. But the actual excavations were performed by Prof. V. Gentili in 1950 and lasted 7 years. About 60 rooms and 350 square meters of mosaics of inestimable value were bought to light..
You can personalize your own tour by choosing different destinations, your own timetable and the accompany of a private guide.